Offered here is a lot of three Mets jerseys worn by “Generation K” pitchers. The first jersey is a button-down road number worn by Bill Pulsipher. This AIS double-knit jersey has “Mets” and Pulsipher’s number “21” sewn on the chest in blue, orange, and black tackle twill. “PULSIPHER” and a second “21” are sewn on the back of the jersey in a similar fashion. A Mets skyline logo is sewn on the left sleeve and an AIS tag with attached size “46” and “L” flags is sewn on the center of the back inside tail. 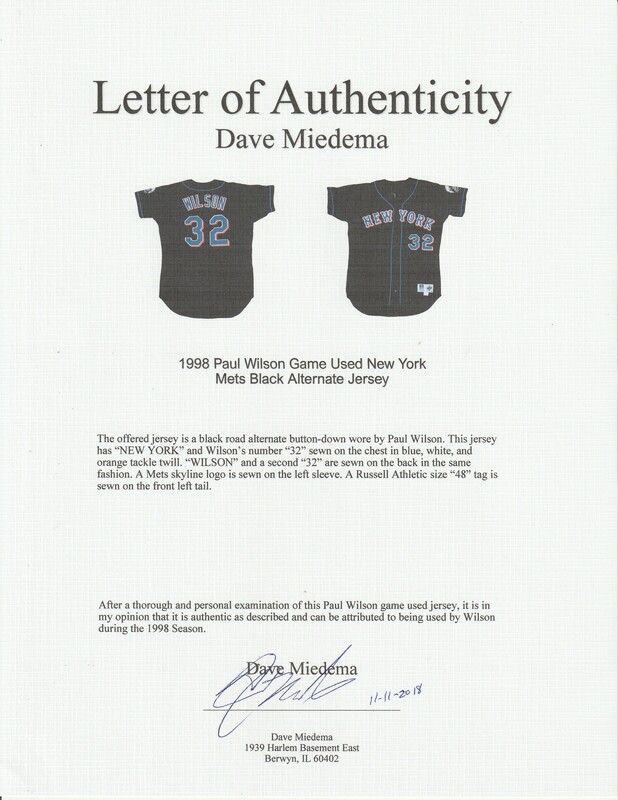 The second jersey is a black road alternate button-down wore by Paul Wilson. This jersey has “NEW YORK” and Wilson’s number “32” sewn on the chest in blue, white, and orange tackle twill. “WILSON” and a second “32” are sewn on the back in the same fashion. A Mets skyline logo is sewn on the left sleeve. A Russell Athletic size “48” tag is sewn on the front left tail. 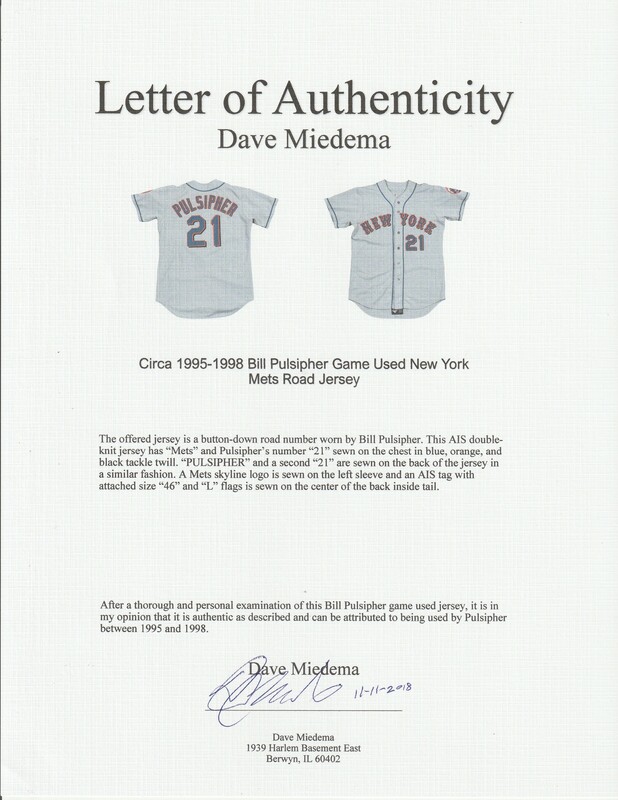 Both jerseys come with a LOA from noted game used expert Dave Miedema. The final jersey in this lot is a gray Mets road jersey worn by Jason Isringhausen in on September 22nd, 2011 during a Mets game against the St. Louis Cardinals. This jersey has “NEW YORK” and Isringhausen’s number “45” sewn on the chest in blue, orange, and black tackle twill. “ISRINGHAUSEN” and a second “45” are sewn on the back in the same fashion. A Mets skyline logo is sewn on the left sleeve. A Majestic size “52” tag is sewn on the front left tail. This jersey comes with a MLB Authenticated hologram (FJ 673400).